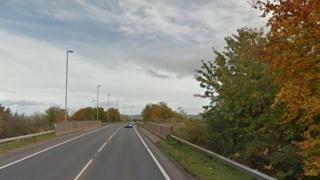 A woman has been taken to hospital after a two-car crash on the Dumfries bypass. It happened shortly after 07:00 between the Edinburgh Road and Cuckoo Bridge roundabouts on the A75. The casualty was not thought to have been seriously injured. The road was shut for a time while emergency services dealt with the incident but the carriageway has now reopened.